The anticipitaed W.D has started dumping rain/hail almost all over Pakistan and in north/nortwest india including Gujarat on Friday. In Pakistan, southern cities like Karachi had rain and rain was reported throughout Sindh and northern regions. Traditional hotspots like Jacobabad and Sibi had a high of only 28c. In India too, the weather changed on Friday in Rajasthan,Gujarat, M.P.,and all the northern states. Temperatures fell to 11c below the normal in places like Bikaner in Rajasthan, and were below normal by almost 6-8c in many other places in the region. With the passage of the W.D., the rains will continue for 2 days, and the temperatures will continue to remain low . What happens now to the monsoon set up ? The NCMRWF has predicted a high pressure of 1012mb forming over the regions of central India and adjoining areas on the 7th. Later it shows the high dissolving in a day and the pressure in the region hovering around 1010mb for the next 2 days. If this happens, the temperatures can drop a bit more in the north of the country on the 7th and 8th. and nights may even go down to 12/14c in some places. And, initial start up of the seasonal low around the areas of Rajasthan may then resume only after the 11th. The strong wind flow from the W.D. has slightly "distorted" the line of wind discontinuity in the south. The map shows the "line " having moved a bit northwards, or, a bit "broken up" in the extreme south. As this current W.D. is expected to trek through northern M.P. 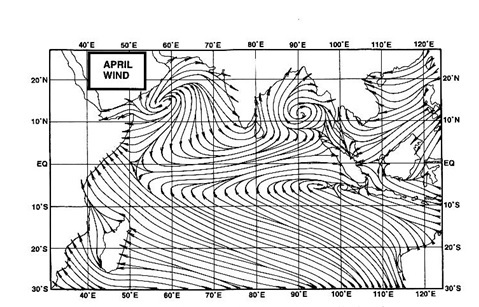 into east India, the winds in the south could re-establish around the 8th./9th. This is as far as the low formation over the land is concerned. For the pre monsoon low over the bay, I do not see any low forming till the 12th. ( normally low could be expected by 15th.). Bay sea temperatures today hover a little below 30c,(map alongside), and, and the absence of cloudiness, it may warm up in a week to the required level. Hence, the initial pre monsoon lows required to be formed over land and sea, can, still start around the normal scheduled dates, that is mid April.